The right people, at the right time - complex staff scheduling made simple! Schedulers can EASILY develop and manage complex departmental schedules, and staff can view and interact with their own personal schedules online. The Schedule is a complete web-based staff scheduling system that offers tight integration with training systems, payroll/personnel data, and Kronos. 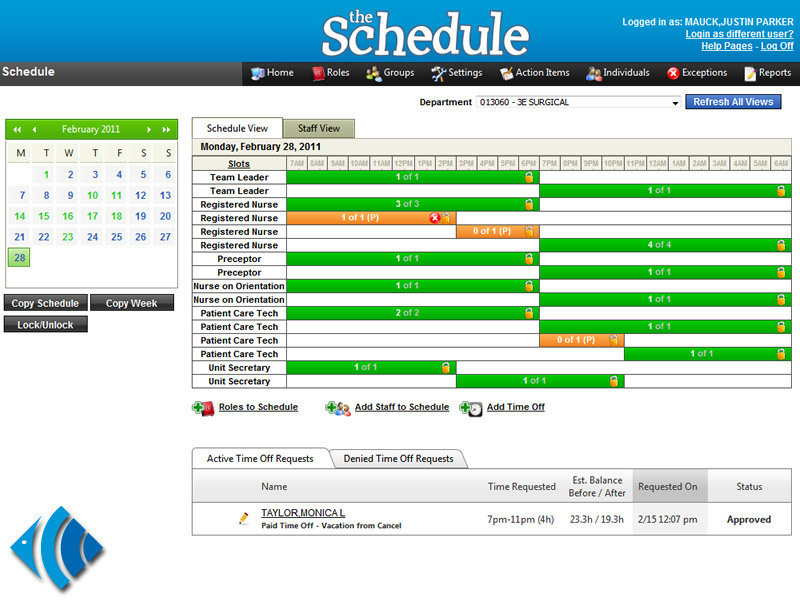 The Schedule allows users within an organization to develop complex departmental staff schedules. Administrators can choose what the role requirements are for each shift by specifying which job codes, certifications, and other qualifications employees must possess to be considered "eligible" to work in a particular role. The Schedule keeps track of how many hours employees are scheduled to work, and prevents users from being scheduled in shifts that have not been marked as "premium" -- individual departments can specify which shifts should pay overtime or other incentive-based pay rates. Additionally, the Schedule contains a full-fledged time-off management system. Employees can request time off through the employee portal, InSite, and administrators can approve or deny the requests as they see fit. The system keeps up-to-date statistics about how much time off employees have in their benefit balances, and immediately alert both the employee and the administrators if a request exceeds the amount of hours the employee has to spend. The Schedule offers organizations a thorough way to manage staffing, and is offered in an easy-to-use interface that requires very little training to operate. The Schedule contains a variety of reports designed to help both schedulers and hospital administrators manage ever-changing schedules and staff, as well as help assess the effectiveness of their staffing patterns. The Schedule is constantly processing organization-defined business rules, including certification checks, total hours worked, and time-off balances. Schedulers and employees are immediately notified when an employee fails to meet one of the base requirements specified. The Schedule has a sophisticated notifications engine built in. Each time an event occurs in the Schedule, notifications can be sent directly to both the scheduled employee AND the department administrators. Notifications can be delivered via email, SMS text messaging, or pagers. 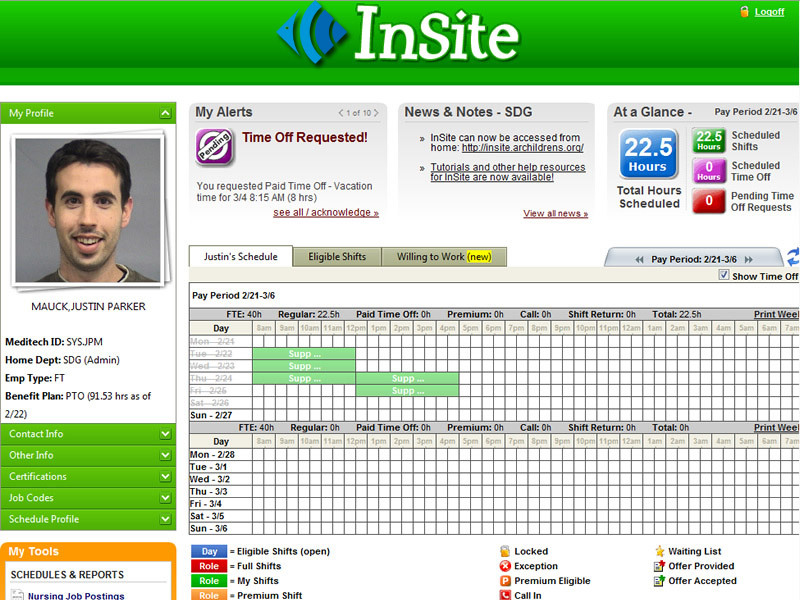 InSite is the "end-user" version of the Schedule. Every employee in the organization will have access to his or her own InSite page, where each one can view his/her schedules, sign up for additional shifts (*), manage certifications, initiate coverage/swap requests, set notification preferences, and much more. Employees can also use InSite to make requests for time off, and view their department's news feed. Organizations can also include links to frequently used forms on each employee's profile page, further cementing the Schedule as a one-stop shop for a variety of employee requests. *Organizations are NOT required to use the Schedule/InSite in a self-scheduling model. 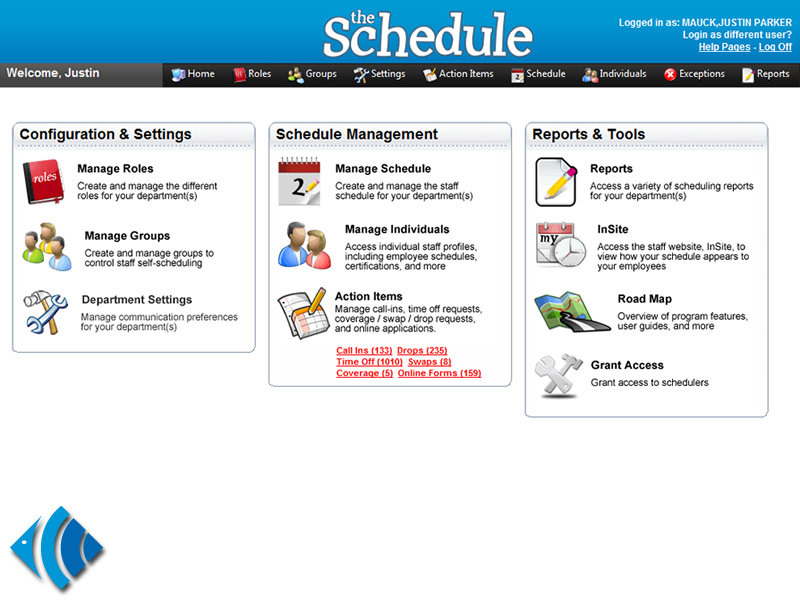 Self-scheduling is configured completely by the Schedule administrators. How long has the Schedule been in production? It has been in production since 2009. To date, over 450,000 employee shifts have been managed using the Schedule. Our institution does not use Meditech. Can we still use the Schedule? YES! The Schedule has been deployed at several institutions. Providing staff with the ability to self schedule has decreased the manual, duplicative efforts that managers used to perform.